Gay Pride Flag, opens a new windowopens a new window by nancydowd, opens a new windowopens a new window / Colors enhanced. 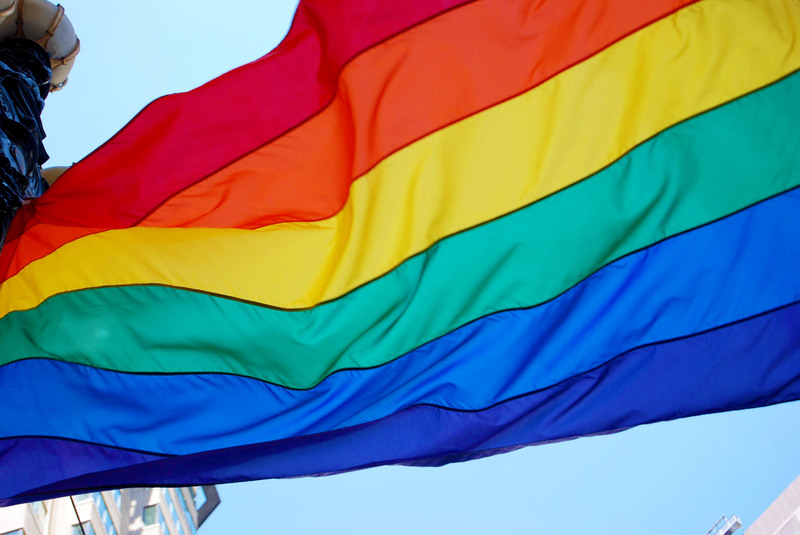 Gay Pride flag. Join San Mateo County Libraries at the 2017 San Mateo County Prideopens a new window event on Saturday, June 10. Many of us are used to traveling to Pride events in bigger cities, but if keeping it local is your jam, then this is the pride party for you! Bring your rainbow swagger and join us! We will have a table, Library Pride button making, and much more. Belmont Library's youth-led Action Group and Book Club. 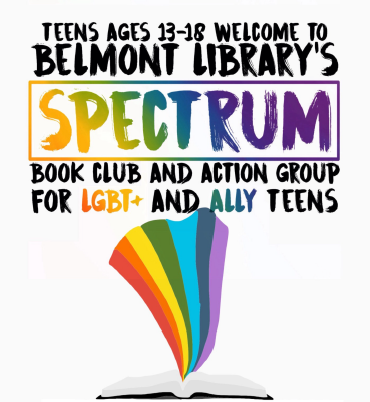 Take the first step in creating change, awareness, & inclusion by joining the Belmont Library's youth-led Spectrum Action Group and Book Club. This club is open to all, but focuses on issues pertaining to LGBTQIA+ youth. Our first meeting focuses on creating change and awareness with actions and our second meeting is a book discussion. So far the group has made a dictionary of LGBT+ terms, pronoun buttons, contributed to The BLT (Belmont Library's Teen Zine), planned and implemented a Pride Celebration for all ages, and volunteered at San Mateo County's new Pride Center and the Pride Celebration in San Mateo. Grades 6-12. The first meetings of the new school year will be Wednesday, September 13 for the Action Group and Wednesday, September 27th for the Book Club. We meet from 3:30-4:30pm in the Belmont Library Taube Room. The San Mateo County Libraries are committed to serving everyone in our diverse community. If your summer reading includes LGBTQIA+ content, check out the 2017 Stonewall Awardsopens a new window (complete listopens a new window | titles in our catalog) honoring books of exceptional merit relating to the LGBTQIA+ experience. For the younger set, the Rainbow Book List for 2017opens a new window is an important source for books with significant gay, lesbian, bisexual, transgender or queer/questioning content, which are aimed at youth, birth through age 18.